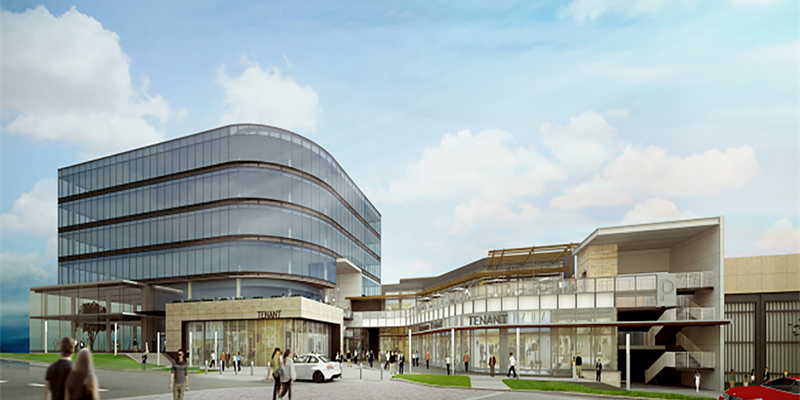 Currently under construction, Hilltop Plaza is a mixed-use development in University Park, Texas that will feature an office building, high-end retail shops, restaurants and a 700-space underground parking garage adding much needed parking to the area. This is a full replacement to an older office building and surface lots. Hilltop Plaza includes 27,000 SF of retail space, 14,000 SF of restaurant space with outdoor balcony seating, 80,000 SF of office space, below-grade parking for 600 cars and an outdoor pedestrian plaza. The ground-floor retail activates the street and provides connections to Snider Plaza. The design for Hilltop Plaza creates a lively mixed-use development on the site of an office building that had been vacant for years. The site, which is adjacent to Snider Plaza, will become the terminus to the already prosperous outdoor retail environment. The building massing is explored in a way to pull any required program height near the main thoroughfare frontage while keeping the low-rise elements adjacent to the residential neighborhood. Special attention was given to privacy and sound transmission when adjacent to any residential neighbors. The street-level building articulation is designed to show a hierarchy of building entrance locations, identification of vertical circulation and inviting pedestrian connectivity as much as possible. To learn more, click here. Expected completion is Spring 2019.